As the recognized leader in Business Service Management (BSM), BMC Software is passionate about their business, their clients, their partners and their events. No place was this more evident than on a chilly winter’s day in our nation’s Capitol, where true-to-size bright flashing stop lights, sky high highway signs, bold street signs, charming houses with window boxes and doors, realistic toasters and bright blue branded old-fashioned mailboxes – red flag up! 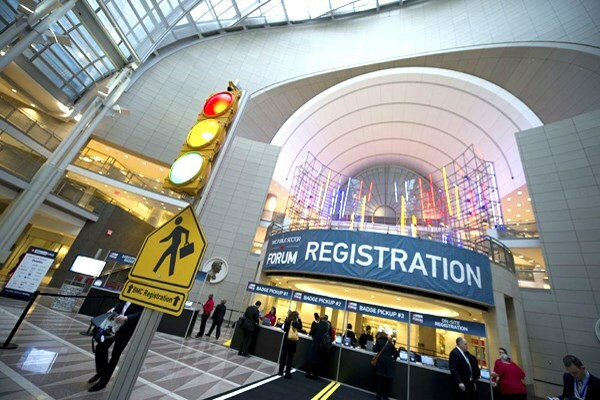 -- were just a few of the creative and captivating design elements found at BMC Software’s Public Sector Forum. Stop lights? That’s right. Early sight visits and collaborative brainstorming with BMC’s Global Events Team put the creative wheels in motion for the 2020 Exhibits Design & Events Team to hit the gas, full speed ahead, transforming a somewhat nondescript event venue into a dynamic, energized environment. 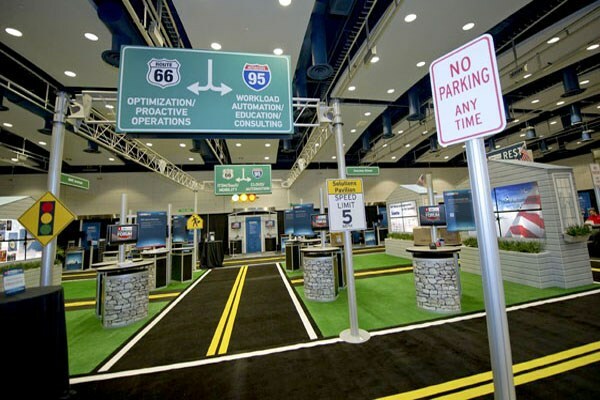 Inspired by the event theme, The Road to Transformation, 2020 Exhibits helped BMC Software create a fully-themed neighborhood environment for its 2012 Public Sector Forum. 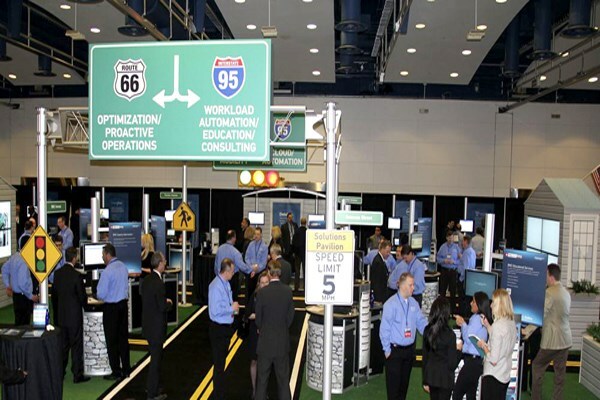 Held in Washington, DC, the private corporate event drew in 1,000 attendees, with 22 Partners. 2020 Exhibits designed and managed the project from start to finish – including creating four individually themed anchor exhibits (also known as homes) for BMC’s Public Sector Divisions along with individual partner-branded pavilion exhibits. The neighborhood design was comfortable and inviting, encouraging attendees to spend more time visiting with BMC and their Partners, whose branded environments could be found right along Partner Avenue. 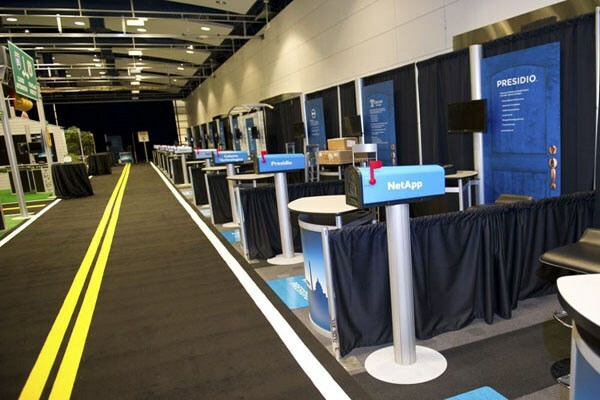 With a fluid, open environment 2020 Exhibits elevated BMC’s event experience, inspiring event attendees to stop and stay awhile, extending the conversation. Sky high signage allowed ample room to accommodate attendee traffic flow, while helping to easily direct attendees to their neighborhood of choice. Creating a strong, memorable anchor for BMC’s four key Public Sector Divisions was also high among the project objectives, in a way that would not only capture attention and encourage interaction but also reinforce the innovative BMC Software brand as the global industry leader. Welcome to the Neighborhood. At 2020 Exhibits, we’re passionate about the experiences we create and how they impact your brand experience. From that very first impression through to the last, 2020 Exhibits can help you in strategic and creative ways to maximize this opportunity and ensure that every aspect of the customer experience works.